Blogging is always full of surprises. I can make a recipe that takes over an hour to prep and cook and then to capture the essence of the dish I can spend another hour photographing it. A blogger never knows how it will be received or what to expect, which makes this work always interesting. For example, this past Saturday, while in my usual hurry to run out the door to do some errands, I threw an egg in a pan and fried it. Then I slapped it on two pieces of toast and took one single picture of it and posted it. I asked a question that brought in nearly 400 comments! So I will pose the same question on it again my friends...."Would you eat this with a knife and fork or would you pick it up and let it run down your arms? 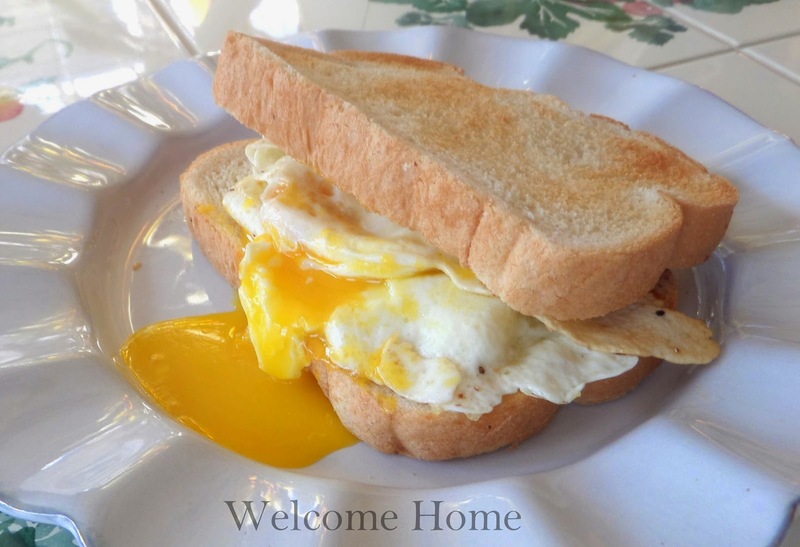 How do you eat your fried egg sandwich?" And for those of you who do not like a runny yolk...oh you don't know what you're missing! Heat butter in skillet on medium heat. Crack egg in the skillet and cook on one side until white is set. Flip over and cook on other side just until set and then serve on buttered toast. Oh yum...I could eat these any time of the day or night!